NCC Scholarship 2018 There is new way to get National Cadet Corps Scholarship of Rs 6000 each per annum to 750 deserving NCC cadets who have completed their Division/Wing academics. Award of Rs 3500 each to the best cadets and Rs 2500 each to the second best cadets in each group. 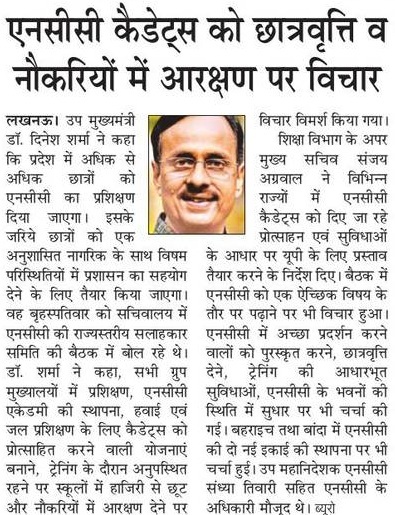 UP NCC Scholarship Scheme 2018:- Deputy Chief Minister of Uttar Pradesh Shri Dinesh Sharma Said we will encourage More and More students to join NCC. Government is in a mood to pass bill of NCC Cadet through which NCC Scholarship and NCC Reservation in Jobs in Indian Army, Navy, Air Force etc. CM Further said through NCC Cadet Scheme students is able to make them Legend in War Like situation. 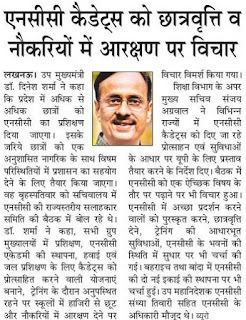 This speech was said in a joint meeting of UP State Level Suggestion Committee. Sahara NCC Scholarship 2018:- Minister Said in every Group, Headquarters, Making scheme Air and Water Training for NCC Cadet Corps, NCC Cadet also receives relaxation on attendance if they unable to attend class, Reservation in Government Jobs. In Meeting it is also decided to include NCC in intermediate class. Application who perform good in their academic class they will receive Prize, Scholarship, Recruitment etc. Eligibility Criteria: - A cadet is expected to complete 80 hours of training per year spreading over the period from August to February. Benefits of NCC cadet: - Can have an easy entry into Police Department, Army, Navy, and Air Force. Criteria. Two scholarships divided into share of Rs 6000/- each for one year will be awarded to JD and JW cadets per NCC Group. a. Minimum 65% marks in Class VIII, IX and X.
b. 5% bonus marks given to SC/ST/OBC candidates. c. One year in NCC in 8th, 9th or l0m class. d. Should have 75% attendance in NCC. NCC 12th Pass Scholarship Scheme 2018 Scholarships for cadets passing 10 + 2 or equivalent examination admitted in regular graduation courses recognized by the UGC viz BA B Sc, B Com, BCA, BBA and fulfilling laid down eligibility criteria. scholarships of Rs 1,000/- each for 12 Month or a year will be awarded to SD and SW cadets per NCC Group. a. Should have passed class XII in preceding two years. d. Should have 80% attendance in NCC. e. Should have obtained minimum 65% marks. NCC Graduate Pass Scholarship Application Form: - Scholarships after 12th Pass for cadets passing Intermediate or its equivalent examination admitted in professional, Management, Medical, Engineering etc of Rs 30,000/- each will be awarded for one year distributed between various States and Union Territories. b. Marks of class XII to form the basis of merit. c. Should have done 2 years of NCC. (a) A certified true copy of Marks Sheet for the qualifying examination. (b) Attested copies of the NCC Certificates, if any. (c) Certificate from the Associate NCC Officer regarding studentship in recent class and continuance in NCC. (e) Attested photocopy of the Scheduled Caste/Scheduled Tribes/OBC certificate issued by the State Govt authority.